In a display of offensive prowess that has just one single peer in Division III history, the Illinois College football team battled to the end but fell to the Rose-Hulman Institute of Technology on Saturday night by a score of 74-68 in triple overtime. The 142 points by the two teams matches the NCAA Division III record for most combined points in a single game, previously held by a 2007 matchup between Hartwick College and Utica College that ended with a 72-70 Hartwick victory in four overtimes. Illinois College took a 19-3 lead early on in the second quarter, but Rose-Hulman roared to life, scoring touchdowns on four consecutive drives to take a 30-26 lead at halftime. The Fightin’ Engineers extended the lead to 11 points, 44-33, after three quarters. The Blueboy defense was able to get some timely stops in the fourth quarter to allow the offense to play catch-up. IC took a 54-51 lead on a touchdown pass from Michael Bates to Bryce Heaton, but later fell behind, 61-54, with less than 90 seconds remaining. Needing to move quickly, Dakota Lammy burst up the middle of the Rose-Hulman defense for a 53-yard rushing touchdown to force overtime. After each team easily scored touchdowns on the first possession of overtime, the defenses took over in the second session. A field goal attempt from each team was no good and a third overtime was needed. Again, IC’s offense was unable to pick up a first down and was forced into a field goal attempt. When the 33-yarder sailed wide right, all Rose-Hulman needed was a score of any kind in order to win. A three-yard plunge provided the difference and allowed the Fightin’ Engineers to escape with the win in the non-conference battle. Despite the loss, Illinois College will still have its name etched in the record books for some time to come. The 117 offensive plays that IC ran in the game is a new Division III single-game record, as are the 231 plays the two teams combined for. Another combined record from the game is the 13 touchdown passes thrown by Bates and Rose-Hulman quarterback Austin Swenson. IC set a program record with its 745 yards of total offense. The previous record was 722 set on Sept. 8, 2012 in a game at Grinnell. Needing 146 passing yards to move into fourth place all-time in MWC history in career passing yards, Bates ended the night with 535 yards. His 42 completions and 73 attempts in the game are both second all-time in conference history and his yardage and touchdown totals on the night are third all-time. Oh, and by the way, Rose-Hulman makes the return trip to play Illinois College at England Stadium in 2015. Elsewhere, the women’s soccer team improved to a perfect 5-0-0 with a 1-0 win over Concordia University (Chicago) on Saturday. Ashley Riley had the game-winning goal for the second straight match. The men’s soccer team trailed twice but was able to manage a 2-2 draw with Concordia University (Chicago) on Saturday as well. Trailing Rockford College two sets to none, the IC volleyball team showed its resolve to earn a 3-2 victory on Friday night. The Lady Blues were hosts of a seven-team tournament over the weekend. Both men’s and women’s cross country finished second at the Bradley Intercollegiate on Friday afternoon. 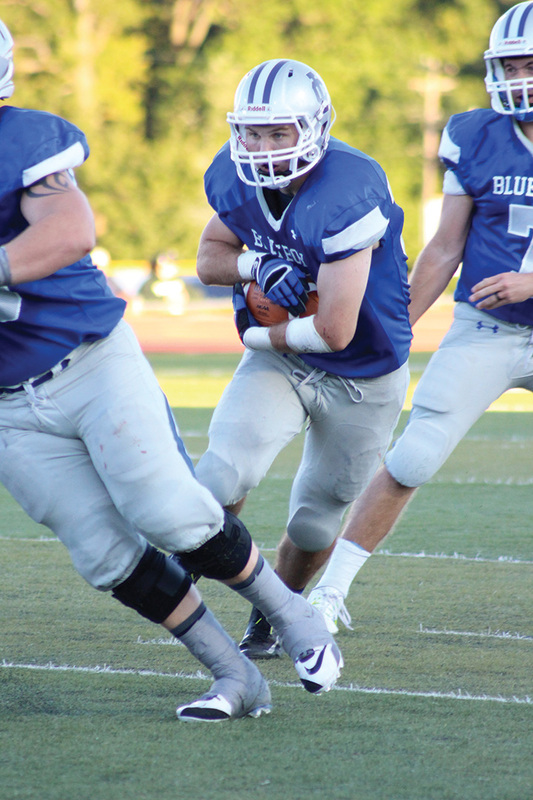 Dakota Lammy, top, ran for 125 yards rushing and 3 touchdowns on 20 carries during Illinois College’s Sept. 13 away game.